Trogón Lodge features 24 standard and 1 superior room. Standard rooms are spread along the property gardens, in modules of 2 (total of 12 modules). Some rooms are closer to the Restaurant and main facilities, and some others are higher in the forest. The terrain is rugged and vertical. Please let us know when booking if you have any walking limitation to try and locate you closer to the main facilities. Check in time is 2:00 p.m. and check out 12:00 noon. We will gladly welcome you before 2:00 p.m., and you may use our facilities while your room is ready. People frequently ask if there is wi-fi in our rooms. There isn’t. We’re already using the maximum bandwidth available for the area of San Gerardo de Dota, and due to the rugged and vertical terrain and spread out location of the rooms, it is not possible, at this moment, to be able to add wi-fi in the rooms. All our public areas do have wi-fi. Take this as an opportunity to disconnect from the city bustle and connect with nature. 10 rooms with 1 Queen Sized and 1 individual bed. 4 rooms with 2 Queen Sized beds. These are for family use and have a maximum occupancy of 2 adults and 2 children sharing beds. Gas operated heating unit in each room (our staff will turn on the unit in the afternoon and will close it in the morning when the temperatures are comfortable). Shared outside porch with rocking chairs. 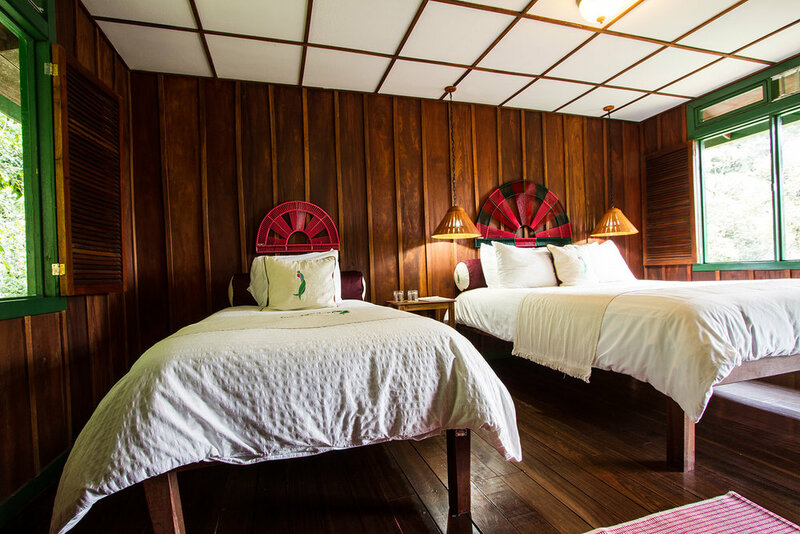 All rooms offer view to the gardens and the natural beauty of San Gerardo de Dota. We want you to relax and connect with nature! Our rooms don’t have TV nor telephone. Room rates do not include sales tax, currently at 13%. Taxes must be added to the rate. Meal rates do not include sales tax (13%) and service tax (10%) that must be added to the rate. Taxes may vary depending any changes in current legislation. Children policy: Children 0 to 4 are free of charge when sharing room with two adults. Children 5 to 11 pay $ 17 USD per night with tax included for breakfast service. Maximum room occupancy is 2 adults and 2 children (2 double Queen Sized beds). Trogón Lodge offers a maximum of 4 rooms for family use. All rates are per room, per night and do not include current sales tax of 13%. Breakfast is included in the rate. Ample room space with one king sized bed. Balcony with wonderful view of the valley and the Lodge. Bathroom features shower and separate Jacuzzi. Bathroom amenities: shampoo and liquid soap. T.V. (only room with T.V. at the Lodge). Perched up on a hill, must climb steps to reach room. In this category children are not accepted. Room rates include for breakfast. 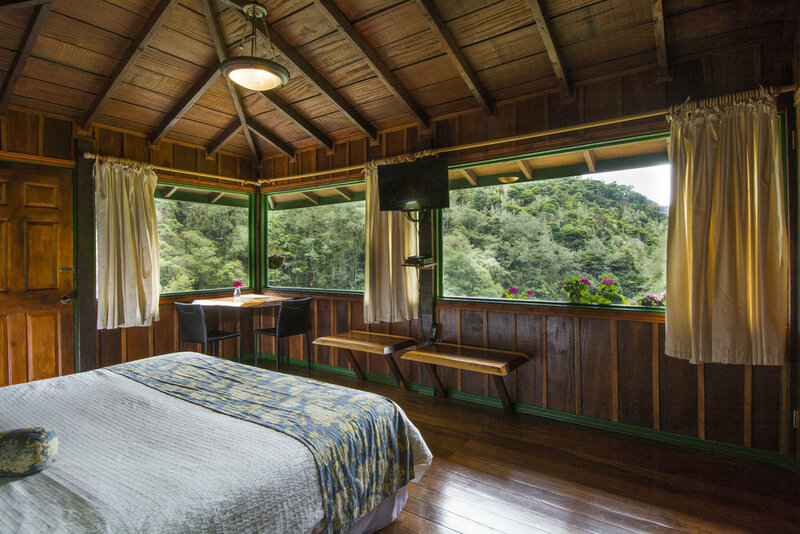 Trogón Lodge features only one standard superior room, and thus, this room is not available for on line booking. We kindly ask you to consult directly with our office the availability of this room for your desired dates of travel. On this link you may also send us a note requesting its availability. 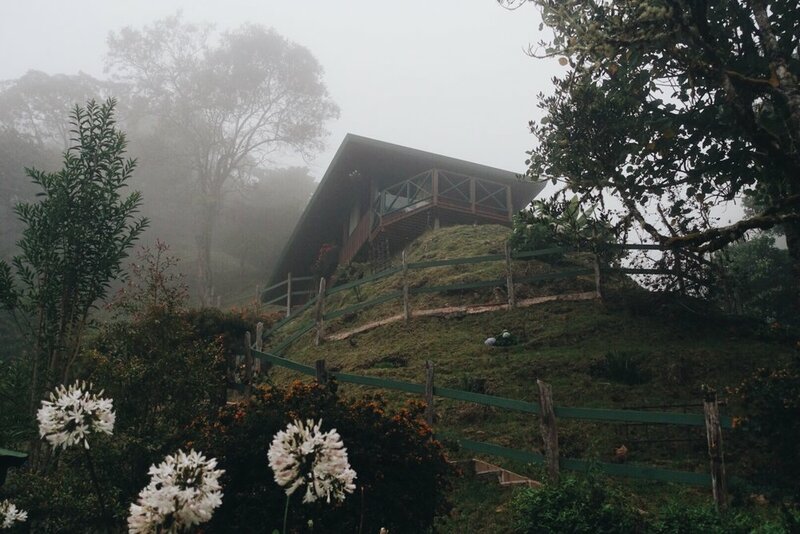 Trogón Lodge now offers a different way to enjoy your couple's time, surrounded by the verdant beauty of the forest and the peace and tranquility of San Gerardo de Dota. We have created a Honeymoon package that includes unique details to make sure memories last for a lifetime. 2 nights lodging in standard room with breakfast included (upgrade to superior room available). 1 private dinner in our lounge for two (according to the Lodge's menu), decorated with candles and flowers. Room decorated with flowers of the area. Sparkling wine in your room upon arrival (house wine). Fresh seasonal fruit from the area and chocolate truffles in the room upon arrival.